These are used with Bare Copper Tape. Used to support Tape to structure. These are used with Bare Copper Tape Conductor. Used to secure Tape to structure. 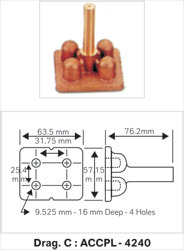 These are suitable for 4 Way Connections, Straight, Through or Tee Joints for Copper Tape. These are used with Bare Copper Tape. Suitable for straight through tape joint. These are secured to Glazing Bar, Steel Frame, Girdles etc. 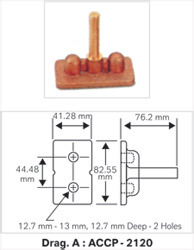 The Item is designed for use with appropriate size of metallic or non - metalic conductor fixing. For use with appropriate DC Tape Clip. It is used when the installation requires the tape to be secured 75 mm away from the face of the wall. Used to secure elevation rod by means of a bolted connection. These are used for connecting Copper Tape to Cable. These are used for joining Aluminium & Copper Tape, Circular Conductors, particularly when Copper is used as earthing in Aluminium lightning protection systems. These Plates when used in concrete structures offer convenient ground system connection point. They are used where reinforcing bars are electrically continous & are to be used as down conductors. 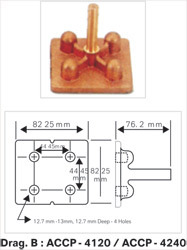 These earth points allow easy access for the lightning protection & earthing system.